Reflecting on the ironies of the internet and the prior incredible growth of the sum of scientific knowledge in the previous and current century, Beliefnet's L'Ordre blog mentions the sheer volume of information available as a source of intellectual laziness and confusion. The result is that, surrounded by more knowledge than ever, people are increasingly starved of actual information because they don't know what to read. Describing information as "worthless" without adequate guidance alongside it, the post notes conspiracy theories are the "worst outcome of all" to come from amateurish attempts to quickly grasp the meanings of vast information available on the internet. 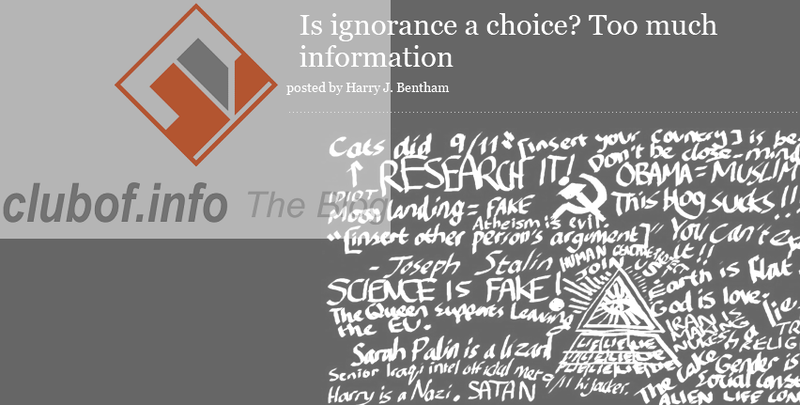 While referencing Carl Sagan's book The Demon Haunted World, the blog post aims to discredit the somewhat famous quote that "in the age of information, ignorance is a choice". Noting that the author of the quote was fairly ignorant himself, the post goes into detail on how the complexities of modern life, technology and science have only made it harder for the average person to grasp it all. The result is that people are finding it hard to grow up and become adults, never mind obtain enough information to be adequately informed about the world and unclouded by falsehoods and online mutterings by amateurs. Concluding that "ignorance is an accident of birth, not a choice", the post notes with great irony that the unlimited ability to self-publish is to blame as "If anyone can tell you how the world works, no-one can". Also of mention is the technological singularity, at which people hand over all governance and control of human knowledge to machines as it is too complicated for them to manage it anymore.